THE GHANAIAN Government has in partnership with the United Nations (UN) launched its Sustainable Development Goals (SDGs) Indicator Baseline Report. The 120-pages report compiled by the National Development Planning Commission (NDPC), Ghana Statistical Service (GSS) and UN, sets the baseline for a selection of indicators that serves as the basis for monitoring and tracking of the progress towards the implementation and achievement of the SDGs and the corresponding Africa Union’s Agenda 2063 targets. The aim of the SDGs and the Agenda 2063 is to eliminate poverty in all its forms and stimulate actions in areas of critical importance to humanity and the planet. It is the first for the SDGs and following Ghana’s final Millennium Development Goals (MDGs) report in 2015. The report provides the baseline status for a set of 56 SDGs indicators and its base year is 2016, looking at one indicator under each of the 17 goals. Under Goal 1, which has an indicator on poverty alleviation, the report says the progress in poverty reduction across Ghana has not been even. 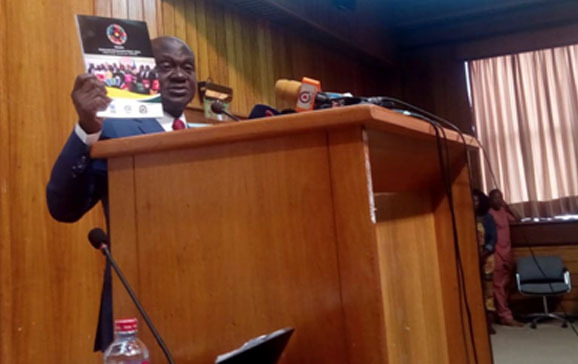 Professor George Gyan Baffour, Minister for Planning, Monitoring and Evaluation, who launched the report on Thursday at the Conference Center in Accra, said Ghana’s approach towards achieving the SDGs is to involve all stakeholders in the implementation. Ghana and 192 other member states of the UN, adopted the 2030 Agenda for Sustainable Development in September 2015 which has a set of 17 goals and 169 targets as the successor framework to the MDGs. The 2030 Agenda, according to the report, seeks to complete the unfinished business of the MDGs, and to stimulate actions in areas of critical importance covering the three traditional dimensions of sustainable development – social, economic and environment. Ghana made significant progress in achieving the MDGs, according to the observed trends in the report, but however suggests that, attaining the SDGs by 2030, requires a shift from the business as usual into a more robust country-level implementation of the goals. The report points to the inter-connections between the SDGs and how actions directed towards achieving a target could contribute positively towards the achievement of one or several other targets. Under Goal 6 of the SDGs which looks at Clean Water and Sanitation, the report indicates that a little over a quarter of the national population enjoy safely managed service, with about half of the population having access to basic service. Urban households are better off than rural households, with over 80 percent enjoying basic services or better, as compared to 60 percent for rural areas. Ghana, according to the report, is also performing greatly under Goal 7 which looks at Affordable and Clean Energy. It says the percentage of the population having access to electricity increased from 69.3 percent in 2012 to 83.1 percent in 2016, adding that the use of Liquefied Petroleum Gas (LPG) has more than doubled; but serious concerns remain with Goal 8 which is Decent Work and Economic Growth. There are still concerns over youth unemployment, with their unemployment rates of 14.4 percent in 2015 becoming more than double the overall unemployment rate of 6.5 percent. About 20 percent of children, according to the report, are found to be involved in child labour while 15 percent are engaged in hazardous forms of child labour, saying child labour is more pronounced in rural areas than urban areas and high among boys than girls. Issues of disparities, according to the report, need to be addressed across board in Ghana to enable the full realization of the SDG targets. But Acting Director-General of the National Development Planning Commission (NDPC), Dr. Grace Bediako, urged a higher level of collaboration among key stakeholders to ensure that Ghana achieves a multiplier effect on the SDGs implementation.